Pretty much the main reason I decided to learn to sew was that I wanted to make stuff for my babies. Yes, you may call me a crazy animal lady. Everyone else does. One of the things I decided to make for the Scoobies was tunnels. I had already made sacks, based on a few tutorials I'd found, but I hadn't found one for tunnels that I liked, so I decided to try figuring them out on my own. 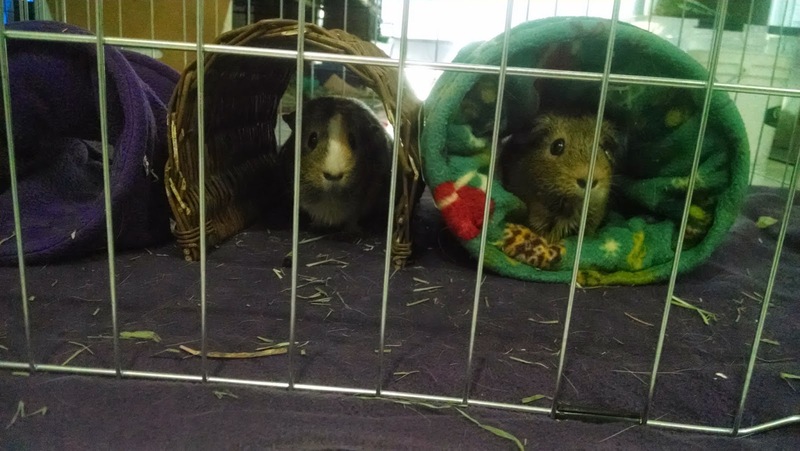 Buffy is hanging out in her astronomy-themed tunnel, while Willow uses the twig tunnel. So, what do we need, other than a sewing machine and thread? One piece of fleece that's approximately 24-28" by 29". I usually look through the fabric remnant section and buy a piece of standard 58" fleece, which makes two tunnels. My piggies are larger, so they won't go in tunnels that are less than 7" in diameter. If your piggies accept smaller tunnels, you can use less than 24". Just keep in mind to count your seam allowances into your calculations. A piece of liner fabric, such as an old towel, Uhaul liner, or just batting, that's the same size as the fleece. I did some research and found that an acceptable substitute for the boning you can find in fabric stores is cable ties. So, I found these. Alrighty, time to get started. I started with a full 58" piece of fleece, so I had to start by folding it in half and cutting it so it was 27" x 29". Apparently the piece I had was 27". Now, cut that piece in half, so you end up with two 27" x 14.5" pieces. I like to square off all the edges, which is pretty easy to do with a rotary cutter and a cutting mat. Ok, down to 26" x 14.5". For this tunnel, I used batting as a liner, but you can also use a more absorbent lining, such as towels or Uhaul liner. Cut ONE piece of your lining that's the same size as your fleece pieces. Line up the lining with the wrong side of one of the fleece pieces. Fold it in half along the long side (26" in this case), with the right side of the fleece inside, and pin the edge. Repeat with the single fleece piece. Time to head to the sewing machine. First, sew the pinned edges. Then, turn the fleece/lining piece so it's right-side out, and slip it inside the still inside-out single piece of fleece. Match up one of the edges and pin. You should have the right sides of the fleece facing each other, and the lining on the inside of the tunnel. Sew along that pinned edge. Then you want to take the fleece only piece and shove it into the center of the tunnel, so all the right sides of the fleece are facing out. I like to turn things once more so that the fleece only piece is on the outside of the tunnel and the fleece/lining piece is on the inside. Now, it's time to grab one of those cable ties. Cut off the head and the pointy tail first. Put the cable tie between the fleece/lining piece and the fleece only piece, right up into the seam you just finished sewing. Pin just below the cable tie. Alright, time for the sewing machine again. Basically, we're sewing a casing for the cable tie. I like to put the foot right up against the cable tie, as close as possible, and sew. Yay, that end of the tunnel is done!! Time for the other trickier side. Grab another cable tie and cut off the ends. Put it up against the inside of the fleece only side and fold the edge over. Pin from the outside. Trust me, that's important. PIN FROM THE OUTSIDE. See, pinned from the OUTSIDE. Make sure to leave a large section for sewing. Once you're done with that, it's time to pin the fleece/lining side. Basically, fold it down so it's the same height as the other side, then pin both sides together. You can remove the pins from the fleece only side as you do this. Remember, pins are your friends. Finally, sew along the cable tie again. One final step before handing this to your piggies. If you didn't already wash the fleece, time to do so now. New fleece comes with a protective barrier that prevents moisture from going through, so you want to break down that barrier. Fabric softener and dryer sheets help replenish the barrier, so do NOT use those. I've had good luck soaking for a few hours in hot water, then one or two hot water wash/dry cycles, but no guarantees for you. Hopefully your piggies love tunnels as much as mine do!! They like to weave through these three tunnels as they zoom around their house. I was just wondering if you could re explain how to close the trickier side? I'm a beginner at sewing and I'm so confused. I'd appreciate it if you could! Jessica. Fold the fleece only side over the cable tie, from the outside in, and have about a half inch section below the tie. Then, pin it from the outside, so you don't see the heads of the pins on the same side as the seam. Fold the fleece/lining side down towards the inside to match the height of the other side and pin that. I actually find it easiest pull out the pins from the previous step and repin with all the layers. Finally, just sew along the cable tie. Hope this helps!! =) Sorry for the delay in response.